Aug 2 Looks like tomatoes! While we were away camping the last two weekends, we left the cat inside the house. Without her watchful presence, a rogue squirrel has been feasting on my garden to the tune of all my large heirloom tomatoes and bean plants. Squash vine borers have destroyed the squash, and my eggplant blossoms keep dropping off. Before I spiraled into complete garden apathy I made this tomato tart. Sophie and I made the pate brisee from her cooking school recipe and didn't quite get the butter into small enough pieces. A lot of that butter is now on the floor of my oven. We blind baked until lightly browned and then added sliced tomatoes, basil, garlic and goat cheese and baked until the tomatoes were soft. It was delicious, and I am reminded of it every time I turn on my oven. Sophie and Ian are camping at Assateague Island next week, and I am on planning on thoroughly cleaning the house. I can then maximize my time in a clean house without anybody else to mess it up. I am almost recovered from the bug bites/poison ivy from the previous two weekends. My feet looked like a page out of a braille textbook. Camping is worth it. 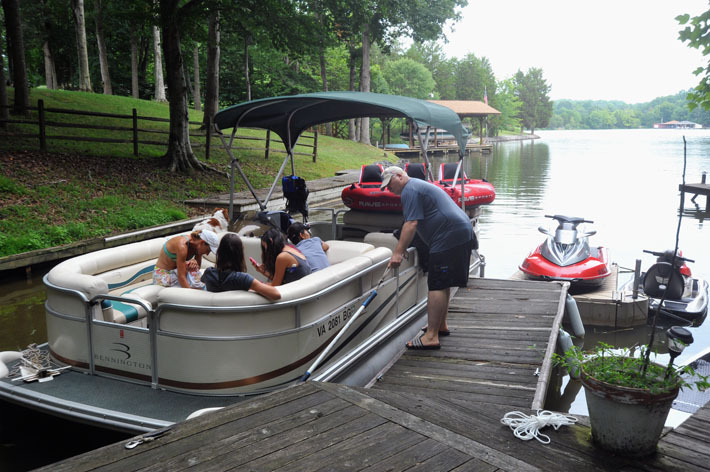 We had a great time at a friend's lake property--boating/eating/relaxing. I made entirely too much food as usual. We brought an entire watermelon back home. Now we can enjoy it with chipotle chili powder and True Lime. My cooking slump continues despite the improvement in the weather. I have a couple of eggplant that I need to use, and a bunch of peaches we got in the "seconds" bin at the farmer's market. Maybe caponata? Definitely a peach pie. The only thing I have cooked this week is a frittata. I made Sophie a pareo out of some Japanese fabric with a toadstool print. I have been hoarding it for at least 4 years. I handed it to her, "One mushroom pareo." She said, "That sounds like something you could eat, like risotto." Even though I have been a slacker in the kitchen, it's not like there hasn't been some heavy lifting going on this week. I delivered 23 lb. worth of baby on Monday. I deadlifted 95 lb. 36 times today at Crossfit, and rode my bike 7 miles round-trip to a CME dinner on "Unintended Pregnancies." Did you know that 50% of the pregnancies in the nation are unintended? Of those unintended pregnancies approximately 50% end in abortion. To prevent unintended pregnancy people need access to effective birth control methods. Guess what happens when you close down clinics that provide low cost, effective birth control? I'm looking at you Texas. Jul 22 Building a better s'more.